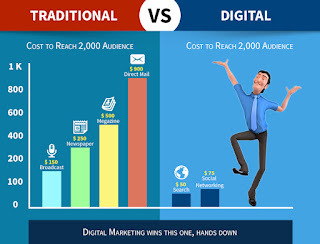 Is there really any difference between Conventional Marketing and Digital Marketing? Every marketing person's first teacher is his experience as a consumer which makes him easy to understand the consumer's requirement before pitching himself. As time passed awareness grew through exposure to media. Today, we are consumers who use our own media channel to interact electronically with companies and their brands. As a result of this, the demand for people skilled in marketing through both traditional and new methods is in ever increasing demand. Despite the growing importance of public relations and new media to businesses that are facing this new marketing reality, very few colleges and universities have been addressing these subjects from a business point of view.